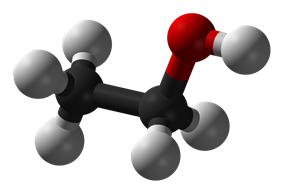 The trihydrogen cation, also known as protonated molecular hydrogen or H3+, is one of the most abundant ions in the universe. It is stable in the interstellar medium (ISM) due to the low temperature and low density of interstellar space. The role that H3+ plays in the gas-phase chemistry of the ISM is unparalleled by any other molecular ion. 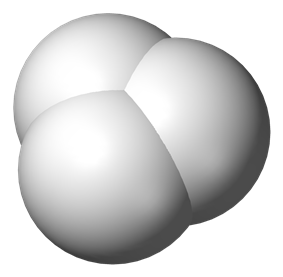 The cation is also the simplest triatomic molecule, since its two electrons are the only valence electrons in the system. It is also the simplest example of a three-center two-electron bond system. H3+ was first discovered by J.J. Thomson in 1911. While studying the resultant species of plasma discharges, he discovered something very odd. Using an early form of mass spectrometry, he discovered a large abundance of a molecular ion with a mass-to-charge ratio of 3. He stated that the only two possibilities were C4+ or H3+. Since C4+ would be very unlikely and the signal grew stronger in pure hydrogen gas, he correctly assigned the species as H3+. The formation pathway was discovered by Hogness & Lunn in 1925. They also used an early form of mass spectrometry to study hydrogen discharges. They found that as the pressure of hydrogen increased, the amount of H3+ increased linearly and the amount of H2+ decreased linearly. In addition, there was little H+ at any pressure. This data suggested the proton exchange formation pathway discussed below. In 1961, Martin et al. first suggested that H3+ may be present in interstellar space given the large amount of hydrogen in interstellar space and its reaction pathway was exothermic (~1.5 eV). This led to the suggestion of Watson and Herbst & Klemperer in 1973 that H3+ is responsible for the formation of many observed molecular ions. It was not until 1980 that the first spectrum of H3+ was discovered by Takeshi Oka, which was of the ν2 fundamental band using a technique called frequency modulation detection. This started the search for interstellar H3+. Emission lines were detected in the late 1980s and early 1990s in the ionospheres of Jupiter, Saturn, and Uranus. In 1996, H3+ was finally detected in the interstellar medium (ISM) by Geballe & Oka in two molecular interstellar clouds in the sightlines GL2136 and W33A. In 1998, H3+ was unexpectedly detected by McCall et al. in a diffuse interstellar cloud in the sightline Cygnus OB2#12. In 2006 Oka announced that H3+ was ubiquitous in interstellar medium, and that the Central Molecular Zone contained a million times the concentration of ISM generally. 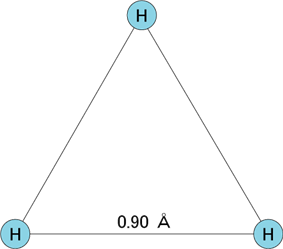 The arrangement of the hydrogen atoms in the molecule is an equilateral triangle. 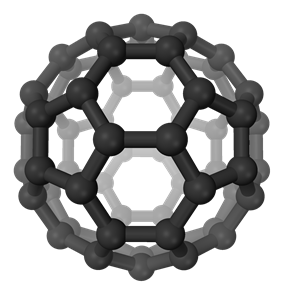 The molecule has a resonance structure which represents a three-centre, two-electron bond. The strength of the bond has been calculated to be around 4.5 eV (104 kcal per mole). This molecule is a good example which illustrates the importance of electron pair delocalization which contributes to the stability of molecules. The main pathway for the production of H3+ is by the reaction of H2+ and H2. The concentration of H2+ is what limits the rate of this reaction. H2+ can only be produced in interstellar space by the ionization of H2 by a cosmic ray. However, the cosmic ray has so much energy, it is almost unaffected by the relatively small energy required to ionize an H2 molecule. In interstellar clouds, cosmic rays leave behind a trail of H2+, and therefore H3+. In laboratories, H3+ is produced by the same mechanism in plasma discharge cells, with the discharge potential providing the energy to ionize the H2. The information for this section was also from a paper by Eric Herbst. There are many destruction reactions for H3+. The dominant destruction pathway in dense interstellar clouds is by proton transfer with a neutral collision partner. The most likely candidate for a destructive collision partner is the second most abundant molecule in space, CO. The significant product of this reaction is HCO+, an important molecule for interstellar chemistry. Its strong dipole and high abundance make it easily detectable by radioastronomy. H3+ can also react with atomic oxygen to form OH+ and H2. At this point, the reaction between OH3+ and H2 is no longer exothermic in interstellar clouds. The most common destruction pathway for OH3+ is dissociative recombination, yielding four possible sets of products: H2O + H, OH + H2, OH + 2H, and O + H2 + H. While water is a possible product of this reaction, it is not a very efficient product. Different experiments have suggested that water is created anywhere from 5–33% of the time. Water formation on grains is still considered the primary source of water in the interstellar medium. The most common destruction pathway of H3+ in diffuse interstellar clouds is dissociative recombination. This reaction has multiple products. The major product is dissociation into three hydrogen atoms, which occurs roughly 75% of the time. The minor product is H2 and H, which occurs roughly 25% of the time. A collision of ortho-H3+ and para-H2. The most abundant molecule in dense interstellar clouds is H2. When a H3+ molecule collides with H2, stoichiometrically there is no net yield. However, a proton transfer still can take place, which can potentially change the total nuclear spin of the two molecules depending on the nuclear spins of the protons. Two different spin configurations for H3+ are possible, called ortho and para. Ortho-H3+ has all three proton spins parallel, yielding a total nuclear spin of 3/2. Para-H3+ has two proton spins parallel while the other is anti-parallel, yielding a total nuclear spin of 1/2. Similarly, H2 also has ortho and para states, with ortho-H2 having a total nuclear spin 1 and para-H2 having a total nuclear spin of 0. When an ortho-H3+ and a para-H2 collide, the transferred proton changes the total spins of the molecules, yielding instead a para-H3+ and an ortho-H2. The spectroscopy of H3+ is challenging. Due to its lack of a permanent dipole moment, pure rotational spectroscopy of H3+ is impossible. Ultraviolet light is too energetic and would dissociate the molecule. Rovibronic (Infrared) spectroscopy provides the ability to observe H3+. Rovibronic spectroscopy is possible with H3+ because one of the vibrational modes of H3+, the ν2 asymmetric bend mode, has a weak dipole moment. Since Oka's initial spectrum, over 900 absorption lines have been detected in the infrared region. H3+ emission lines have also been found by observing the atmospheres of the Jovian planets. H3+ emission lines are found by observing molecular hydrogen and finding a line that cannot be attributed to molecular hydrogen. H3+ has been detected in two types of celestial environments: Jovian planets and interstellar clouds. In Jovian planets, it has been detected in the planet’s ionospheres, the region where the Sun’s high energy radiation ionizes the particles in the atmosphere. Since there is a high level of H2 in these atmospheres, this radiation can produce a significant amount of H3+. Also, with a broadband source like the Sun, there is plenty of radiation to pump the H3+ to higher energy states from which it can relax by stimulated and spontaneous emission. The detection of the first H3+ emission lines was reported in 1989 by Drossart et al., found in the ionosphere of Jupiter. Drossart found a total of 23 H3+ lines with a column density of 1.39×109/cm2. Using these lines, they were able to assign a temperature of the H3+ of ~1,100 K (830 °C), which is comparable to temperatures determined from emission lines of other species like H2. In 1993, H3+ was found in Saturn by Geballe et al. and in Uranus by Trafton et al. H3+ was not detected in the interstellar medium until 1996, when Geballe & Oka reported the detection of H3+ in two molecular cloud sightlines, GL2136 and W33A. Both sources had temperatures of H3+ of about 35 K (−238 °C) and column densities of about 1014/cm2. Since then, H3+ has been detected in numerous other molecular cloud sightlines, such as AFGL 2136, Mon R2 IRS 3, GCS 3-2, GC IRS 3, and LkHα 101. Unexpectedly, three H3+ lines were detected in 1998 by McCall et al. in the diffuse cloud sightline of Cyg OB2 No. 12. Before 1998, the density of H2 was thought to be too low to produce a detectable amount of H3+. McCall detected a temperature of ~27 K (−246 °C) and a column density of ~ 1014/cm2, the same column density as Geballe & Oka. Since then, H3+ has been detected in many other diffuse cloud sightlines, such as GCS 3-2, GC IRS 3, and ζ Persei. To approximate the pathlength of H3+ in these clouds, Oka used the steady-state model to determine the predicted number densities in diffuse and dense clouds. As explained above, both diffuse and dense clouds have the same formation mechanism for H3+, but different dominating destruction mechanisms. In dense clouds, proton transfer with CO is the dominating destruction mechanism. This corresponds to a predicted number density of 10−4 cm−3 in dense clouds. In diffuse clouds, the dominating destruction mechanism is dissociative recombination. This corresponds to a predicted number density of 10−6/cm3 in diffuse clouds. Therefore, since column densities for diffuse and dense clouds are roughly the same order of magnitude, diffuse clouds must have a pathlength 100 times greater than that for dense clouds. Therefore, by using H3+ as a probe of these clouds, their relative sizes can be determined. ^ Thomson, J. J. (1913). "Rays of Positive Electricity". ^ Hogness, T. R.; Lunn, E. G. (1925). "The Ionization of Hydrogen by Electron Impact as Interpreted by Positive Ray Analysis". ^ Martin, D. W.; McDaniel, E. W.; Meeks, M. L. (1961). "On the Possible Occurrence of H3+ in Interstellar Space". ^ Watson, W. D. (1973). "The Rate of Formation of Interstellar Molecules by Ion-Molecule Reactions". Astrophysical Journal 183 (2): L17. ^ Herbst, E.; Klemperer, W. (1973). "The Formation and Depletion of Molecules in Dense Interstellar Clouds". Astrophysical Journal 185: 505. ^ a b Oka, T. (1980). "Observation of the Infrared Spectrum of H3+". ^ a b Drossart, P.; et al. (1989). "Detection of H3+ on Jupiter". ^ a b Geballe, T. R.; et al. (1993). "Detection of H3+ Infrared Emission Lines in Saturn". Astrophysical Journal 408 (2): L109. ^ a b Trafton, L. M.; et al. (1993). "Detection of H3+ from Uranus". Astrophysical Journal 405: 761. ^ a b Geballe, T. R.; Oka, T. (1996). "Detection of H3+ in Interstellar Space". Nature 384 (6607): 334–335. ^ a b McCall, B. J.; et al. (1998). "Detection of H3+ in the Diffuse Interstellar Medium Toward Cygnus OB2 No. 12". ^ McCall, B. J.; et al. (2004). "Dissociative Recombination of Rotationally Cold H3+". Physical Review A 70 (5): 052716. ^ a b c Herbst, E. (2000). "The Astrochemistry of H3+". ^ a b McCall, B. J.; et al. (1999). "Observations of H3+ in Dense Molecular Clouds". Astrophysical Journal 522: 338–348. ^ a b c d Goto, M.; et al. (2002). "Absorption Line Survey of H3+ toward the Galactic Center Sources I. GCS 3-2 and GC IRS3". Astron. Soc. Japan 54: 951. ^ Brittain, S. D.; et al. (2004). "Interstellar H3+ Line Absorption toward LkHα 101". Astrophysical Journal 606 (2): 911–916. ^ McCall, B. J.; et al. (2003). "An Enhanced Cosmic-ray Flux towards ζ Persei Inferred from a Laboratory Study of the H3+-e− Recombination Rate". Nature 422 (6931): 500–2. ^ Oka, T. (2006). "Interstellar H3+".